Luster’s is a world renowned brand that offers a fine variety of products for all kinds of Afro hair, their nourishing systems have helped millions of moms get rid of their little one’s hair problems. The nutrient-rich formulas help effectively in lifting the dirt off your scalp, and get rid of all the residues without stripping the hair fibers of their natural oils and moisture. The products contain vitamin E that penetrates the hair shaft to moisturize it from within and get rid of any brittleness. 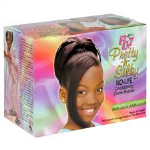 The moisture rich compounds detangle the fibers and helps keep all the fly-aways under control. The vitamin fortified formulas add softness and shine while making your hair light and beautifully bouncy. Young hair fibers need to stay protected and harmful products should be avoided at all costs if you want your children’s hair to grow strong and long. Luster’s PCJ is a line of formulas that are highly effective and show visible results! With consistent usage, you can kiss all of your little girl’s hair problems goodbye!